I parted ways with Oscar and The Colonialist after about 5 days on Lembongan. They were off to megalithic Sumba to do battle with potentially heavier waves, questionable sanitation practices and roaming packs of rabid dogs. How’d it go, men? 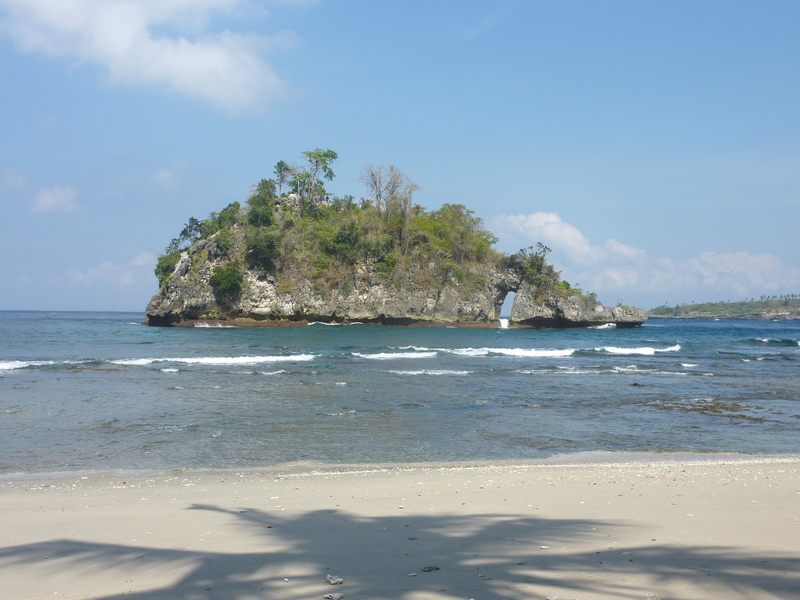 I stayed on for a few days longer to surf a bit more and check out Nusa Penida… another neighboring island that is far less populated or touristed than Lembongan. One of the waiters at the Nusa Indah told me that his father is a fisherman and he could run me over to the island and pick me up later in the day as there is only one regularly scheduled public boat to the island each day and it required getting to the port at around 4:30 a.m. and staying overnight on Penida neither of which was I planning to do. Another of the bartenders grew up on Penida and arranged for a friend of his to meet me at the port with a motorbike which would be mine for the day for the princely sum of $6. Game on. Nusa Penida is awesome. A couple of narrow paved roads (which are probably more accurately characterized as paths) circle the island and cut through the somewhat mountainous interior. The island isn’t all that big… about 200 square kilometers. While I passed mini transport trucks here and there throughout the day, by and large, the road traffic was limited to motorbikes and pedestrians almost all of whom were quick with a “halo!” and a smile and a wave when we passed each other… particularly the uniformed schoolkids I saw walking home from school in the afternoon. I didn’t encounter another traveler all day and thus I’m guessing we make for a little bit more of a novelty here than in Lembongan. First stop was Crystal Beach which was stellar save for the dive boats clogging up the view from the beach. I suppose that is to be expected however as the reef just offshore has the reputation of being one of the best around Bali. I had a look around with my trusty fins and goggles and can verify that the reputation is well deserved. Beautiful coral and truckloads of colorful fish. 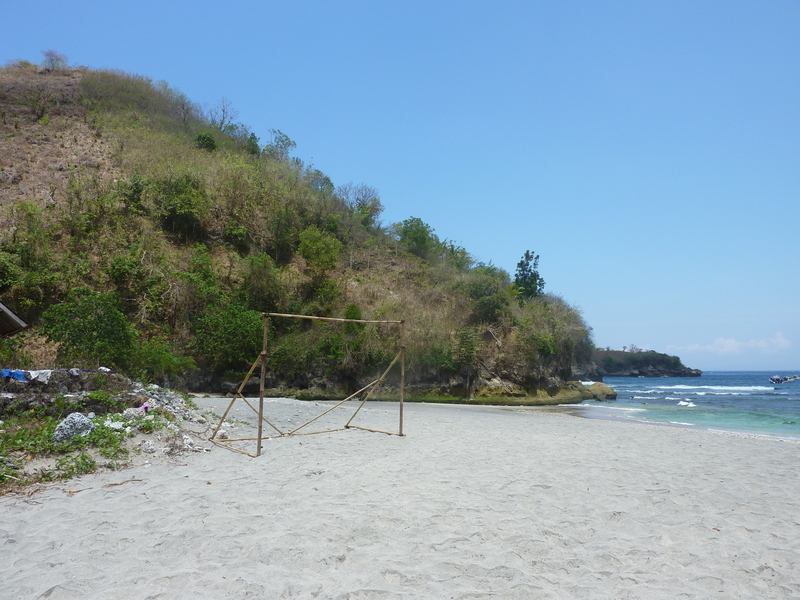 The beach itself is fairly awesome as well and includes one of the best positioned goals of all time. How badly did I want to rip off a couple of PK’s? Unfortunately there was neither a soccer ball nor a keeper and thus I spent my time there exploring, lounging and snorkelling without a snorkel. Snorkel. Snorkel. Snorkel. I never realized how weird that word is until just now. Snorkel. Weird. In the afternoon I pulled over along a tree-lined, shady stretch of road on the northern side of the island fronting the water to relax for a while on a sea wall looking out over a series of seaweed plots. It took me a minute or two to realize that off in the distance across the strait (which I believe is called the Selat Badung? 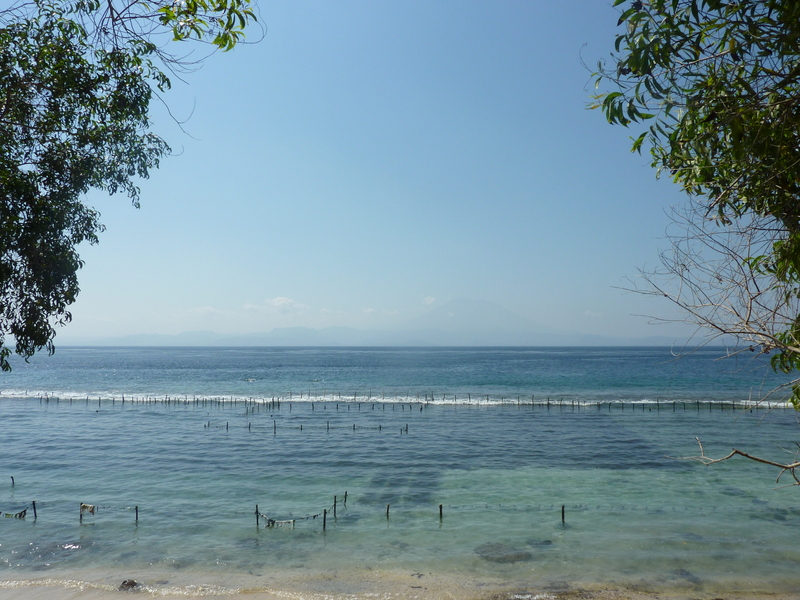 ), and back on Bali, the volcanic silhouette of Gunung Agung was visible through the haze or fog or mist or smoke or smog or whatever combination thereof it is that sometimes obscures views in and around Bali. It seemed to just materialize out of nowhere once I took some time to do nothing and stare off into the distance. Funny how that happens. I swear there really is a volcanic mountain off in the distance on Bali. Look harder. After a while, a dude pulled over on a vintage Honda motorcycle. It was red and white and looked like a dual sport from the 70’s. He grabbed a seat next to me and we began chatting. He introduced himself as Wayan and told me he was the 13th child in a family of 13. He is 38 and has a wife and many girlfriends. He’s a seaweed farmer with 7 seaweed plots and he uses all his spare money to refurbish old motorbikes. He says he doesn’t like the new ones because no one looks at him when he rides them. But everyone looks at him when he rides an old bike. His English was great and amongst the many opinions he shared with me were the following: Vespas are cool, people from Java are ruining Bali, Italian and Spanish women are the best in bed and Indonesians are not good at basketball but black people are. Good talk, Wayan.